One of my favorite television shows of all time is Millennium. 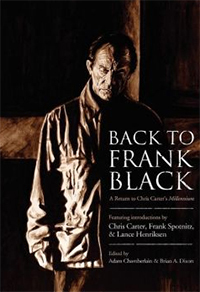 Created by Chris Carter following his success with The X-Files, Millennium follows former FBI profiler Frank Black (Lance Henriksen) journeying into the darker recesses of society as he tracks down criminals as a law enforcement consultant for the shadowy Millennium Group. The series zoned in on the dichotomy of light and dark / good and evil in society at the time, and in retrospect was a watershed moment in television for the abundance of procedurals and darker shows that would follow in a post-9/11 world. After three seasons, the show came to an end, canceled by Fox, and leaving fans wondering what happened to Frank Black. In the many years that have followed, the fans of Millennium have never forgotten the series – and neither has Lance Henriksen, who has stated many times his hopes for a Millennium movie. And that’s where Back To Frank Black comes in.